With medical satchel in hand, Dr. Herbert Simmons, the local coroner, climbed onto the porch steps. He was responding to a call received at the East Orange, N.J., headquarters only a little while before at 4:40 p.m. On the other line, an unusually calm voice reported, “There has been an accident. “Come in, Sir,” summoned the suspicious woman in shadowy attire. With one determined move, she opened the door slightly and led Simmons down a dark corridor to the end of the hall. There at the end of the hall, he turned the knob, pushed the door open to see a beautiful, female figure lying in a half-filled bathtub. Her legs were doubled up over her knees, her left hand was lightly grasping a wash cloth, and her head was completely submerged in the water. As Simmons’ attention shifted to a note pinned to a pile of clothing on the floor, he began to surmise that this morbid scene was possibly suicide. How could one of Murfreesboro’s most cultured, highly progressive, educated women Virginia Oceania Wardlaw find herself the centerpiece of one the most notorious, bizarre crimes of the early 20th century? Her niece, Ocey Martin Snead, was found dead drugged and emaciated in her home, Nove. 29, 1909. Also, Ocey became the center of a scandalous murder case involving her mentally unbalanced mother, Caroline Martin, and a spinster aunt, Virginia Wardlaw. Along with a third sister, Mary Snead, they were thought to have conspired to drug and starve Ocey to order to collect $32,000 in insurance money. 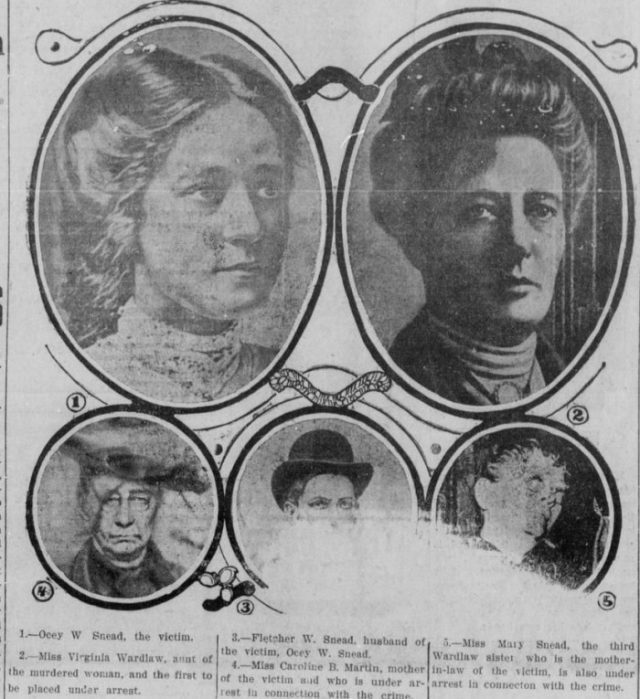 By Dec. 22, 1909, Virginia and her two sisters, Caroline and Mary, were indicted for the murder of Ocey Snead. Apparently, the evidence against the sisters turned in the case when after an autopsy disclosed a small amount of morphine in the blood. All three sisters, including Ocie’s mother, Caroline Martin, were charged with the crime. During the turn of the 2oth century, the strange bathtub murder mystified the country. 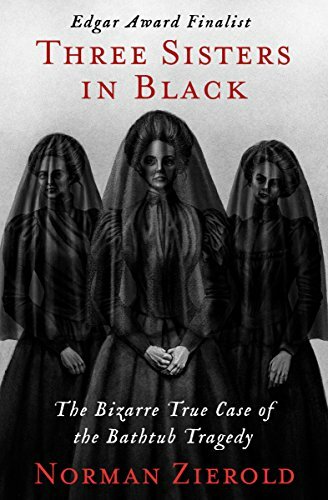 Virginia Wardlaw, Caroline Martin and Mary Snead became known as the, “Three Sisters in Black” for during the trial every day, they dressed in incriminating funeral attire–black veils and long black gowns. They were convicted, but Virginia Wardlaw died in prison before sentencing in August, 1910 from either heart failure or self-imposed starvation. Caroline Martin’s charges were reduced to manslaughter, and she was sentenced to a 7-year prison term in January, 1911. Two years later she was removed from prison and placed in the New Jersey State Hospital for the mentally insane where she died on Jan.20, 1913. Eventually, Mary Snead was totally exonerated and released when she agreed to become a material witness against her sisters in the murder case. In 1930, 21 years after the murder, the Murfreesboro News Banner reported a statement from Mrs. Mary Snead who was located in Oakland, Calif., at the time living with her son. She began to shed some light on the many sinister happenings that led up to the tragic death of Ocey Snead. Mary Snead clarified in the interview that Virginia Wardlaw was an angel on earth and was not guilty of the murder that she was accused. Ocey’s mother, Caroline Martin, had been negligent and irresponsible when dealing with her supposedly mentally unstable daughter, Ocie. The names Wardlaw and Snead mean little to the present generation in Rutherford County. However, at the turn of the 20th century, they were synonymous with distinction in education. Virginia Wardlaw was head mistress for the Soule College which was located on the site of the Murfreesboro Housing Authority today. Virginia and her sister, Mary Snead, operated the Soule Female Academy from 1892-1907. In the beginning of her administration at Soule, the school prospered. Miss Wardlaw was considered one of the most educated, cultured, and highly progressive educators of her day. Her innovation expanded the curriculum at Soule to include Latin and Greek as well as other humanities such as ethics and the Bible. There were advancements in studies of the anatomy of animals with the dissection of animals and study of vital organs of the body. Other sciences were taught in a well-equipped laboratory in which students could conduct experiments. There were even visiting lecturers from Vanderbilt. Strange happenings began to occur after their sister, Caroline Martin, came from New York City to live with them at Soule College. Mary Snead explained in the 1930 interview that the insane Mrs. Martin and her daughter, Ocey were taken in out of pity. Weird tales began to surface among the impressionable students at Soule. Supposedly, one story has it that the sisters, dressed in black and heavily veiled, would call for a carriage, always at night, and drive to the Evergreen Cemetery (on Greenland Drive today). There, they were seen hovering around a grave and talking softly. Other neighbors reported that the women often wandered at night by candlelight on the campus of the school suspiciously attired in long flowing black dresses. Apparently, Caroline Martin introduced occultism to them when she came to live with her sisters. The result was devastating. Teacher and students became frightened and left the school. Circumstances continued to worsen until 1907 when the college’s severe financial situation caused the sisters to turn their operation over to the school’s administration and leave Murfreesboro for East Orange, N.J. Although many believed Mrs. Snead’s account, there seems to be some unsolved mystery surrounding these elusive characters of the sisters themselves that hinted of black magic ending tragically and mystified the entire nation at the turn of the last century. Were they murderesses, deliberately evil? Or were they splendidly proud and baffling creatures, full of pathos, deserving pity? Did their involvement in the occult ultimately lead to their social, emotional, and economic demise and disgrace?